Ever stumble across a street address on the web—yes, an actual street address—and wish you could quickly pinpoint it on a map? Well, the usual way to go about it is to copy and paste the address into Google Maps in another browser window. 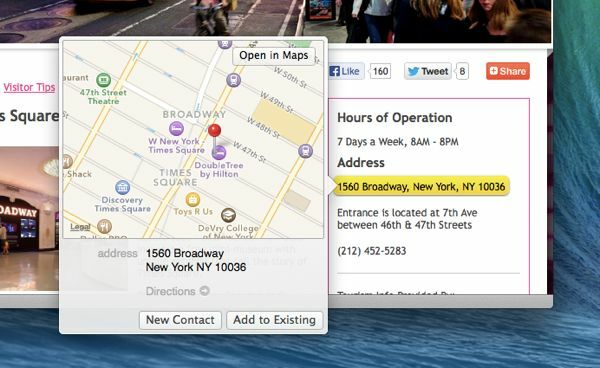 But the latest version of the Safari web browser in Apple’s big “Mavericks” update for Mac OS X saves you a step, allowing you to map a street address directly within Safari. Want to map an address within Safari? Just right-click it, then select “Look Up” from the pop-up menu. So, find a street address on a web page? Highlight it with your mouse, then right-click it, either by pressing and hold the CONTROL key, then clicking the highlighted address, or by clicking the address with a two-finger tap. 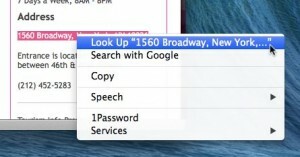 Select “Look up: [the street address you highlighted]” in the pop-up menu that appears. And…bingo! A map of the location should pop up right within Safari. You can zoom the map by pinching on your Mac’s trackpad, or rotate the map by twirling your fingertips. You can also create a new contact in your Mac’s Address Book app by clicking the New Contact button, or you can open the address in the new Maps app.